...is 90 Minutes of Fun! This film documents a wide range of silent classics with clips from comedies made between 1895 and 1925. Starting out with the earliest moving images that show people having fun, this documentary went quickly through early French trick films including chases and reverse footage films which gave a good insight to the early comedies. Highlighted performers include Billy Bevan, Charles Chaplin, Sydney Chaplin, Charley Chase, Andy Clyde, Carter DeHaven, Vernon Dent, Oliver Hardy, Buster Keaton, Harry Langdon, Stan Laurel and 'Snub' Pollard. The narration is quick and lively and very educational. Chase scenes are examined in depth including those on foot and those in motor vehicles. 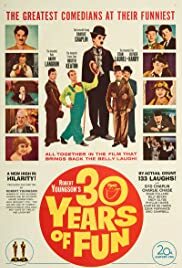 The physical humor throughout the film, and the clips from films not often highlighted elsewhere, makes this a must see for anyone looking for information about the early silent film comedies.